Europe's offshore wind industry has united in a call for policymakers to provide long-term funding certainty, as new figures reveal the market slowed in 2014, will be even quieter this year and 'slump' in 2016. According to the latest key trends and statistics report from the European Wind Energy Association (EWEA), 1.5GW of new offshore wind capacity was added to the grid in 2014 - more than 5% less than in 2013. (Scroll down for full report). The market outlook for 2015 remains stable in terms of capacity to be brought online, with 12 offshore projects currently under construction across the continent; increasing installed capacity by 2.9GW, bringing the total to 10.9 GW. But 2016 will see a slump in the market, according to the EWEA, with a much lower level of wind turbines being connected. The UK is unlikely to fully commission any hundred-MW scale offshore wind farms, with a small extension to the Kentish Flats project likely to be the only new development to come online. 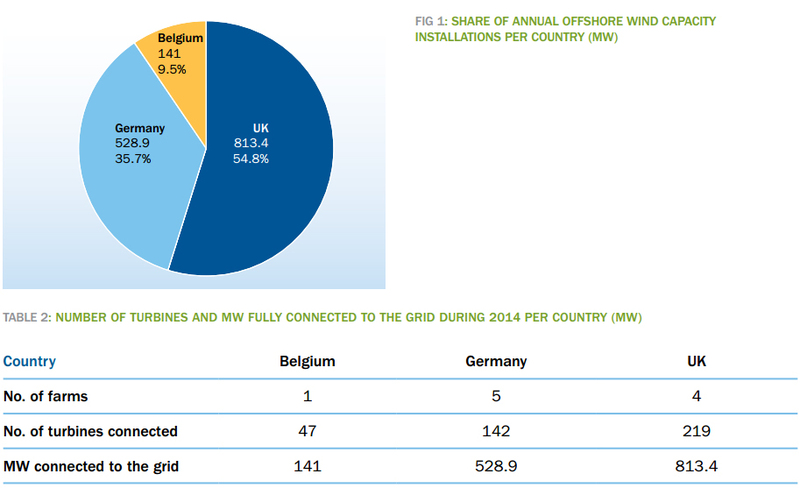 Only Germany and the Netherlands are expected to bring capacity online in 2016. EWEA's deputy chief executive officer Justin Wilkes said: "It is not surprising that we see a levelling-off of installations in 2014 following a record year in 2013. The industry has seen exponential growth in the early part of this decade and this is a natural stabilising of that progress. "Offshore wind will have a monumental part to play in the EU's energy security drive as part of the European Energy Union but it is political determination that will help Europe unlock its offshore wind potential." It is this political determination that was the focus of the Scottish Renewables' Offshore Wind and Supply Chain Conference last week, as the sector stands poised for the results of the crucial first round of Contracts for Difference (CfD) allocations this month. ScottishPower Renewables' managing director Jonathan Cole said: "Working in this industry is a rollercoaster: one day optimism, the next day despair. "It feels like now as if we are an industry in retreat - that our hopes have been raised and very rapidly confounded. But we must remind ourselves that we are an industry which is growing and creating jobs. "There are a lot of reasons for us all to be optimistic about this sector, but we need a much more stable political environment in which to operate." The conference was attended by all major European offshore wind players including DONG, Siemens and SSE. The EWEA, which was also in attendance at the conference, did conclude that the UK will continue to lead the world in offshore wind to 2030, but a German construction drive will see it overtake the UK as the world's biggest installer this year. "Germany is set to buck the trend this year," added Wilkes. "The UK has more installed offshore capacity than the rest of the world combined but this year shows that other countries in the EU are making serious investments in the sector. "The nine financial deals closed in 2014 - of which four were billion-Euro projects - suggest that activity will pick up substantially as of 2017 as these projects begin to hit the water."